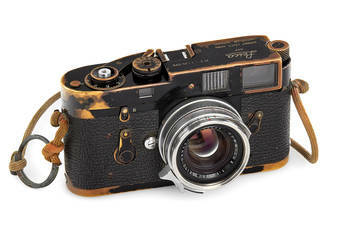 Original black paint Leica M2 owned and used by famous US press photographer Sean Flynn, son of actor Errol Flynn and known for his striking coverage of Vietnam War. On April 6th, 1970, Flynn with his fellow photojournalist Dana Stone chose to travel on motorcycles into the communist-held part of Cambodia, they were captured by Viet Cong forces, never to be seen again. Flynn's camera shows significant signs of wear due to the years of professional use in extreme conditions, still it is in perfect working order, attached to the camera is a short strap made from a parachute cord, with steel ring from a hand grenade. Included with this lot are 34 modern prints from Flynn's Vietnam coverage. Original black paint MP delivered to New York in 1957, owned and used by French Photographer Gérard Bois (Gérard-Aimé), known for his press coverage of the volatile period of civil unrest in France 1968, with rare black paint Summicron 2/5cm no.1468967. Only 141 black paint MP cameras have been made, most of them have been sold to professional photographers - it is one of the most iconic Leica cameras. 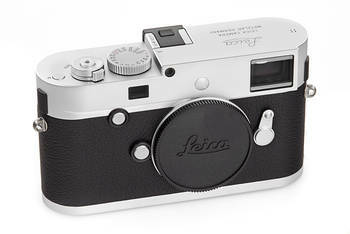 Introduced in 2012 Leica M Type 240 was another milestone in Leica history. Two years later an M-P model was released with upgraded electronics and minimalist design. 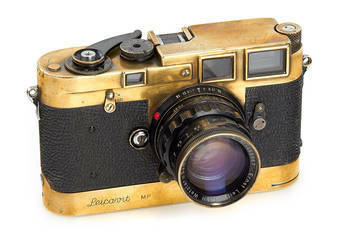 Leica decided, that this camera is worth honouring with a very special serial number. The camera no.5000000 is a Leica M-P 10772 and it is being kept now in Leica Museum in Wetzlar, we are pleased to offer a camera with successive number 5000001 in our auction.